On October 17th, Hawthorne's NJROTC cadets Jordy Fuentes, Nick Moncada, Jonathon Villagomez, and Meghan Uitz competed in the JROTC Air Rifle match against a diverse number of schools from as far north as Reedley California to San Diego. 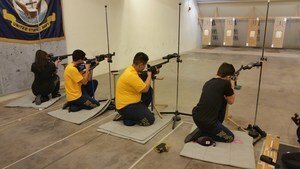 Hawthorne finished 2nd place overall in all three positions (standing, kneeling, and prone​) . Cadet Jorddy Fuentes took 1st place as the highest scoring cadet as well as the 2nd highest shooter in kneeling and prone. Cadet Villagomez took 3rd in standing as well.